After a twenty-one year career teaching art and ceramics in higher-education, lead designer and potter John Donovan knows how to make clay work. John has long been recognized for his award-winning ceramic sculpture (receiving an honorable mention in 2005 at the Third World Ceramic Biennale in Icheon, South Korea as well as the Individual Artist Fellowship in Craft Media from the Tennessee Arts Commission in 2011) and is represented by LeMieux Galleries in New Orleans and Zeitgeist Art Gallery in Nashville. In 2007 he began collaborating with chef Tandy Wilson of City House Restaurant to create custom ceramic ware designed to endure the extremes of a busy restaurant kitchen as well as lend an aesthetic edge to the table. As word-of-mouth spread, he began accepting additional commercial and residential commissions, working with clients to create one-of-a-kind signature pieces for their businesses and homes. In the Fall of 2015, Tenure Ceramics was officially launched in Nashville, Tennessee. On a microscopic level, clay particles (platelets) are disorganized until the potter compresses them by wedging and wheel-throwing. The result of this compression is an organized spiral platelet structure that is tight and strong. Ceramic is a thermodynamic material, it expands and contracts when it heats and cools. The platelet structure of well-made work is organized, and a finished piece of pottery generally returns to that structure once it cools. If not carefully crafted, a finished piece of pottery may soften a bit every time it heats and cools, fracturing or gradually losing strength. This isn’t much of an issue for pottery used at home, but high-temp dishwashers are often used in restaurants to sanitize tableware. Due to the heat and heavy use pottery gets in this environment, inferior work can quickly loose density and more easily break. Although it requires more time and skill to make, well crafted wheel-thrown tableware is ultimately a more enduring addition to your restaurant or home. Microscopic photography of disorganized clay platelets(L) and compressed platelets(R). 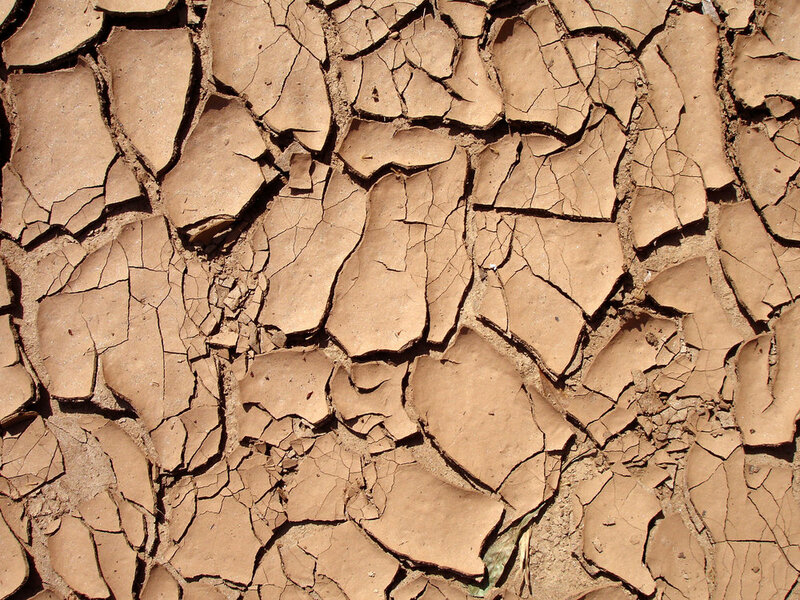 Dried clay in a creek bed forms patterns that mimic the microscopic hexagonal platelet shape.